So Long Mr. Chumps is a personal favorite of the Three Stooges short films. 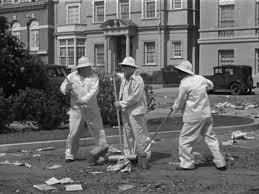 It begins with Moe, Larry and Curly as street sweepers, cleaning up a park, and in general assaulting each other with their brooms – a very funny sequence. Curly then finds some papers that turn out to be bonds, which our honest Stooges decide to return to their rightful owner. The man is delighted and offers the Stooges a reward – if they can find an honest man with executive ability. 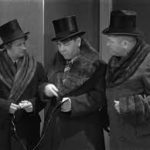 The Three Stooges then try to find an honest man, baiting a ‘lost’ wallet, but to no avail. It’s a very funny sequence, where several “dishonest” people steal the money out of a wallet, including a faux “blind man” — and the only “honest man” they find is a dog, who leads them to a crying woman, whose fiancee is an honest man! Where is he? In jail, of course (for something he didn’t do, naturally). In a funny bit, the Stooges then try to get themselves thrown into jail, but keep failing. Unintentionally they manage to get arrested at the police station where police officer Vernon Dent refuses to arrest them, and they finally get arrested while saving a police officer. While “working” at the prison they find the man who they will help break out of prison. 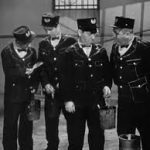 In one of the best-remembered Stooge moments, they paint over their prison stripes, to make them look like guard uniformsâbut neglect to paint the back sides. Trying to walk out of prison, they see none other than the ‘honest’ man who originally hired them, who turns out to be a swindler. 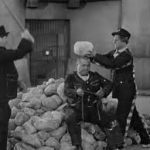 The short ends with the Three Stooges on the rock pile, in a very funny moment where they are putting rocks on Curly’s head, and breaking them with a sledgehammer. What appears to be a bit of ad-libbing occurs here, when Larry picks up a real rock, and Curly says “Hey, wait a minute! That’s a real one! I’m no fool! Nyuk, yuk!” and all three smile broadly. So Long Mr. Chumps is a very funny Three Stooges short film, and highly recommended. 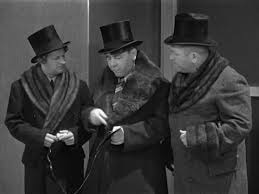 Moe (Moe Howard): Can we have some money on account? Curly (Curly Howard): On account of we’re broke! Moe (Moe Howard): [to Curly] remind me to have you stuffed. Moe (Moe Howard): The only honest man we’ve found all day, and he’s a dog. Curly (Curly Howard): He wouldn’t make a good business executive. Or would he? Larry (Larry Fine): I wonder where he hangs out? Curly (Curly Howard): They generally hang out on the gallows. At the very end, Larry picks up a real rock and Curly notices. He comment “Hey, wait a minute! That’s a real one, I’m no fool.” You can see Larry cracking up at the attempted joke.